Almost every other day, I find myself feeling bad at my ignorance of truly brilliant books, and alternately feeling overwhelmed and almost desolate at the thought that I can in no way read even half of all the wonderful books available in my lifetime. I am not sure how I got by all these years without coming across Man’s Search for Meaning. 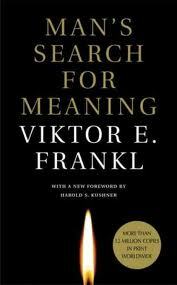 Victor Frankl was a psychiatrist who put forth the theory of Logotherapy, based on the core existential philosophy that man’s fight for survival, even in the most grim and tragic circumstances is because of his ability to attribute meaning and purpose to his life. This might seem very simplistic and almost intuitive (or counter-intuitive), but the depth of this theory comes to light as Frankl assesses it during his three years at the Nazi concentration camps. This is an extremely inspiring, practical and realistic book, which holds a very special place in my shelf. One would think that the repeated mentions, memoirs and stories surrounding the World War II and the concentration/death camps would eventually make one turn a little numb at the horrors and extent of dehumanization. But no matter how many versions you hear, see enacted, or read, the horrors intensify and haunt you even more. I can’t imagine how there were human beings who survived through so much damage to the body, mind and spirit. I am one of those who wouldn’t even survive if I were asked to imagine it all for a day. Frankl’s recounts at the concentration camps touched me so deeply, almost flipping my heart inside out, because of his approach at narrating his experiences, the tone he takes, and the analytic angle he deftly uses to dissect the prisoners’ (and the guards’) psychology - the stages of their mental states, the reasons for them, and the ways by which he and some others manage to rise above it all. Frankl started working on Logotherapy as a potential psycho-therapeutic technique to help people combat depression, and thoughts of suicide. At the concentration camps, he could use his personal experiences, as well his objective observations of his fellow prisoners to validate his speculations and theories. His book therefore has a fine balance between realism, philosophical speculation and psychological validation. I agree with his underlying assertion that human beings abandon their will to survive and get bogged down in depression if they lose their anchoring to find a meaning, a cause, a purpose, or any goal in their life (i.e., if they sink into an existential vacuum). Doesn’t matter if life probably is indeed meaningless, random and arbitrary (as the Nihilists believe), or if the innate purpose of our existence is merely the procreation of our genes (as the natural-selectionsists assert). At times of intense tragedy and absurd circumstances, it doesn’t help to be reminded that Life is random and meaningless; such a belief is likely to crush the spirit, and worse, bring out the animalistic tendencies of survival. It’s much more practical and utilitarian to orient ourselves to a goal, a meaning or a purpose to develop and refine our most humane tendencies and mature the spirit. It’s by far the most constructive technique of growth and acceptance. Frankl regards human-beings to have the potential to face the worst, and emerge unbroken in spirit. He views them to be much more than “brain-machines”, a humane departure from most other scientists and psychiatrists. He therefore rejects the notion that human-beings can be reduced to their biological determinants. I strongly favor this approach, although I keep my mind open to every possible theory. I realize that it’s good to be in a state of equilibrium with regards to such theories and speculations on the human mind/spirit, for it helps one stay objective. But in dire situations, I concede that it’s natural and even necessary to adopt a tragic optimism (in Frankl’s words) to remain strong in spirit and continue working towards something constructive. I reached a kind of epiphany with Frankl’s assertion that, suffering needs to be attributed to a cause or a purpose for it to be bearable. How true! That’s all the mind needs to know to reconcile with pain and misery. And that’s precisely the reason why Religion tries to associate meaning, even if they be myths, to every suffering possible (more wonderfully argued by Jopseh Campbell, in The Power of Myth). And Spirituality teaches techniques to reach a state of equanimity wherein we view suffering as means to our growth. I appreciate the fact that all of these techniques and preachings eventually lead us to take responsibility of our Life, and remind us that we are in control of the attitude we adopt to deal with the circumstances. The Nihilists may just regard this as a boost to the Human-Ego, which it probably is, because of the pedestal on which we place the human spirit and its ability to elevate, but it’s a wonderfully practical tonic! Doesn’t matter if we live through an illusion of sacrifice and a lofty ideal, if it helps us embrace the unimaginable. I strongly believe that techniques of Logotherapy are one of the most practical approaches towards psychotherapy. It deals with providing people who are struggling with misery, a meaning and goal to work towards. The existential purpose need not be arbitrary or even idealistic. Even the basic responsibilities - such as being responsible for our family, is a valuable goal. It urges us to take responsibility of our life, and reminds us that our life is something unique and irreplaceable. Neitzche’s words are quite apt - “He who has a Why to live for, can bear almost any How”. This is a book that I’m sure to resort to multiple times to gain inspiration. Well written, as usual:-) I am somewhat wary of psychology-based books, for I feel they either lead to profound wisdom or existential angst, and its hard to tell in advance where one'll end up :-) From your post, the tone in the book seems optimistic, and I think I'll give it a try. Hi Rafiki, (I gather you're a Lion King fan, and so am I... a huge fan! :)) Thanks a lot for visiting and sharing the wonderful video! I really wish I had met him/or attended his talk in person. Usually I stay away from books that deal with the Holocaust because I get far too disturbed, but this book did a great job of uplifting your spirits even in the context of the atrocities. With such a strong reco, I'll definitely give the book a shot. Thanks:-) I strive to be all that, and have a long way to go .